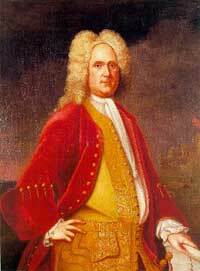 In 1730, the British government appointed Alexander Spotswood, a former lieutenant governor of Virginia, as deputy postmaster general of America. That year, Spotswood established New Post, the first post office to serve the European settlers who had settled in southern Fauquier County, then part of Stafford and King George counties. The post office was on land he owned on Massaponax Creek, then a navigable tributary of the Rappahannock River, close to his iron-mining prospect. A historical marker denotes the site, five miles southeast of Fredericksburg. Mail destined for the Virginia Piedmont was received and sorted at New Post, then sent westward by horse and cart. At its closest point, southern Fauquier was 14 miles away. A rider first took a ferry across the Rappahannock and then journeyed four to six hours. Riders carrying the mail were not paid but usually were men who knew or lived near the recipient. Servants, slaves or tenants were sometimes dispatched to pick up mail, but delivery of letters by a non-recipient was common until 1790, when paid post riders began to transport mail. Addresses on letters and packages would note a prominent recipient's name and colony and sometimes the county. As there were few towns and villages through the early 1800s, the recipient's farm or plantation name might be added. If the recipient was not well known, a phrase such as "in the care of" or "near" would be added before a place name or prominent person's name. These usages were standard before the advent of rural free delivery in the early 1900s. Envelopes were a rarity, and addresses were written on the blank side of a folded letter, which was sealed with wax. In 1737, Spotswood appointed Benjamin Franklin as postmaster of Philadelphia. Franklin was a 31-year-old printer, writer and publisher of the Pennsylvania Gazette newspaper and "Poor Richard's Almanack." The Pennsylvania Gazette often printed items from other Colonial newspapers, so Franklin was aware of events in the Atlantic colonies. This knowledge, and Franklin's exactitude in accounting matters at the Philadelphia post office, led the British to appoint him joint deputy postmaster of America in 1753. The other joint deputy postmaster was William Hunter, postmaster of Williamsburg, Virginia's Colonial capital, and publisher of the Williamsburg Gazette. Franklin and Hunter authorized establishment of several Virginia post offices in port towns, including four where mail for Fauquier and Loudoun counties would be received, sorted and sent by horseback or conveyance to its destination. The post office in Fredericksburg, which succeeded New Post when it opened in 1755, initially served Fauquier. In 1771, a post office opened in Dumfries in Prince William County and was closer to northern Fauquier. Within three decades, however, Dumfries's position as a port for goods and postal matter would wane because of the siltation of its Potomac River estuary, Quantico Creek. The post office that opened in Alexandria in 1760 initially served most of Loudoun County. In 1774, a post office opened in Colchester and was convenient for eastern Loudoun because Ox Road had been improved between Leesburg and Colchester. But like Dumfries, Colchester's Occoquan River became too shallow for larger vessels by the early 1800s. In 1794, a post office opened in Falmouth on the Fauquier side of the Rappahannock River. Being closer than Fredericksburg, it became the main repository for mail bound for southern Fauquier. But the Rappahannock above Fredericksburg was prone to siltation, and within three decades, Fredericksburg -- assisted by bridges across the Rappahannock -- again became the center for the westward mail. The earliest post offices in Loudoun and Fauquier dotted the major east-to-west roads from Alexandria, Falmouth and Fredericksburg to Winchester, then among the 10 largest cities in Virginia. These roads approximated today's state Routes 7 and 9 and U.S. Routes 17 and 50. The first postal route from Alexandria to Winchester went along what was called Potomac Ridge Road or Eastern Ridge Road, which ran about a mile south of present-day Route 7 and then veered onto Route 7 east of Goose Creek. At Leesburg, the road followed today's Dry Mill Road before veering onto today's Route 9 to the West Virginia border at Keyes' Gap. Leesburg was a two-day journey on horseback from Alexandria. The first post office in the Virginia Piedmont opened in Leesburg on March 20, 1793. The Post Office Department spelled the town name "Leesburgh" until 1894. The department authorized three post offices in rapid succession west of Leesburg: Waterford in 1800, Hillsborough in 1801 (shortened to Hillsboro in 1893), and Wheatland in 1802. The Waterford and Hillsborough post office buildings are the oldest survivors in the Virginia Piedmont. East of Leesburg, the 1807 Lanesville post office still stands in Claude Moore Park. As with many post offices in small villages, the building served as a combination store, tavern and hostelry. When the main road from Alexandria to Leesburg shifted north to its present Route 7 alignment in 1817, Whaley's Store, at the Broad Run bridge, supplanted Lanesville as the main post stop in the area. Storekeepers, tavern keepers and mill owners were usually the postmasters through the early 1800s. They knew how to keep expense ledgers and handle money. Often, the proprietor added "Store," "Mill" or "Tavern" to the post office name to advertise the business. All postmasters were appointed by the Post Office Department. West of Leesburg, the forerunner of Route 7 replaced the circuitous Route 9 as the main mail route to Winchester by 1820. In 1807, a post office opened in Snickers' Gap -- which became Snickersville in 1830 and Bluemont in 1900 -- at the base of the Blue Ridge along this shorter route west. In 1822, it was joined on this route by Purcell's Store (Purcellville in 1852) and in 1827 by Hamilton's Store (Hamilton in 1835) and Woodgrove, three miles north of today's Round Hill. The Purcell's Store post office still stands. Hamilton's Store residents said in 1835 that they would prefer Harmony as the name of their post office. Harmony was the name of the village's first church of 1833, and Harmony Hall was the name of the 1806 home of Richard Tavenner, who donated land for the church. But there was already a village named Harmony in Halifax County, and no two Virginia post offices could have the same name. So the residents proposed Hamilton, surname of the village storekeeper. Along the Falmouth and Fredericksburg road to Winchester, today's Route 17, Fauquier Court House probably was Fauquier County's first post office, established Oct. 2, 1797. The village's post office name was changed to Warrenton in 1825. The Elk Run Church post office in southern Fauquier also dates from 1797. Elk Run Church (Elk Run in 1819) was a midway stop between Falmouth and Fauquier Court House. The other early post offices along this corridor, from east to west, were Morrisville, which opened in 1811, Germantown in 1822, McRaeville (midway between Marshall and Warrenton) in 1828, Salem in 1809, Ash's Store in 1805, Grigsby's Store (by the Fleetwood Mill) in 1828 and Paris in 1801. Ash's Store (Oak Hill in 1817) was the first known area post office established at the whim of a prominent person. The store was adjacent to Oak Hill plantation, home of John Marshall, third chief justice of the Supreme Court. The Oak Hill post office lasted until 1852, even though the post office in Salem, the largest town in northern Fauquier, was only four miles to the east. Despite the rule that no two post offices in the state could have the same name, there was another Salem in Roanoke County, established three years before the one in Fauquier. There was much confusion, but the duplication lasted as long as it did because much of Marshall's mail was addressed to Salem, Fauquier County, spelling out which county. In 1830, the Post Office Department, still deferential to Marshall, changed the Salem, Fauquier, name to "Salem-Fauquier." Only in 1882, well after Marshall's death, with mix-ups still common, did the department demand that the Fauquier Salem change its name. Residents chose Marshall, then the magisterial district name. The final stop on this southern mail route to Winchester was Paris, where a mail carrier would meet with another carrier who rode along the middle route from Alexandria, present-day Route 50. Both mail packets were then combined before being sent west into the Shenandoah Valley. The Paris post office opened in 1801 as did those in the eastern Loudoun villages of Springfield (Arcola in 1832) and Goshen, at the corner of today's Braddock and Goshen roads. Goshen had been called The Post, a name dating to Colonial times, when saddlebags were taken off horses coming from Alexandria or Colchester and thrown onto a horse that went north on Goshen Road to the Leesburg and Ashburn areas. That road was known as Old Leesburg Road well into the 19th century. Along the westerly stretch of the Route 50 corridor, Middleburg became the first town to boast a post office, on Oct. 2, 1797, the same day that postal authorities approved the Fauquier Court House post office. The town's official post office name was "Middleburgh," with the final "h" holding on for nearly a century. Flanking Middleburg on the east was the Aldie post, 1811, and on the west, the Upperville post, 1807. By 1830, 25 post offices had been established in Loudoun and 22 in Fauquier. Their postmasters were compensated according to payments they received from people prepaying their mail. Many people mailed postal matter without paying for it because recipients could also pay the postage. When people refused to pay for mail addressed to them, it had to be sent back to its destination if it had a return address. In those cases, the Post Office Department received no compensation for its round-trip efforts. Prepayment became compulsory in 1855. Mail costs were first based on the number of sheets in a letter and the distance it traveled. Packages were sent by privately owned wagons or conveyances at an agreed-upon rate. In Loudoun and Fauquier, packages were first sent by the U.S. mail in the early 1830s, when stagecoaches, under contract with the government, began to ply the forerunners of Routes 7, 50 and 17. Letter and package rates became based on weight and distance in 1845. Letter rates were set at 3 cents a half-ounce in 1863, regardless of the distance sent. As mailings increased in the early 1830s, so did the number of Loudoun and Fauquier post offices and the compensation of postmasters. During that decade, Leesburg's postmaster regularly made more than $400 a year, Middleburg's and Warrenton's postmasters more than $300 and Upperville's postmaster more than $200. The postmasters of Aldie and Waterford averaged about $100 a year. In some smaller post villages, though, the postmaster didn't earn $10 a year. At Elk Run, postmaster Thompson Smith did not handle a single prepaid letter in 1835, so he earned no money that year. But the amounts, big or small, usually increased as the years passed, and because the postmaster's job was part time and the average daily wage $1, the position became a coveted one. Thus, toward the middle of the 19th century, the era of the "Democratic" and "Republican"post offices in Loudoun and Fauquier began. After the Confederate takeover of both counties' postal systems, there was a post office every two miles so no one would have to walk more than four miles to pick up mail.